Coughlin had committed to UMass this past October but decided a few weeks ago to re-open his recruitment. According to U.S. Hockey Report, North Dakota, Michigan State and Western Michigan were also in the running for his verbal. Boston Herald reporter Richard Murray tweeted that Coughlin had told him "BU was my dream school. Grew up wanting to be a Terrier." During his senior season at CM, Coughlin was team captain and led the Knights with a 50-point campaign (28G, 22A), earning all-scholastic recognition from both the Boston Globe and Boston Herald . After attending Montreal Canadians Pro Development Camp in June, the left wing signed on with Vernon. After adjusting to the pace of the BCHL, Coughlin came on strong, putting up an 18-27-53 scoring line—third best on the Vipers—in 53 regular season games. He’s added six goals and five assists in 15 playoff games, thus far. 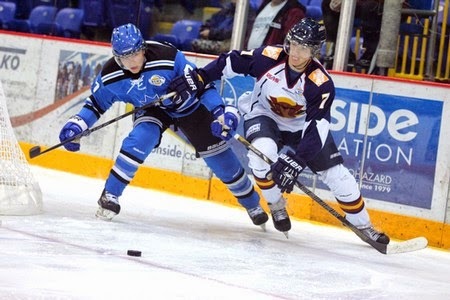 This past Sunday, he scored a goal and two assists, earning first star honors, as Vernon thumped Coquitlam, 6-1, in the leagues’ round-robin semifinals. Coughlin’s father played at Michigan State for three seasons. His brother, Kevin, played for the NTDP and then in the QMJHL for three seasons. Besides Noonan, former Vipers who have played for BU include Sahir Gill and Ryan Santana.